Many assume that the PR industry as we know it now is a shallow reflection of our image-obsessed, consumer society. And although PR as an industry really only started in earnest in the 1940’s – if you ask Harold Burson, founder of one of the original PR firms Burson-Marsteller, he’ll tell you that PR has been applied in one form or other since the very dawn of human communication. And this, for me, lies at the very heart of successful PR – it’s all about human nature. This is as true now as it was 70 years ago when press releases were typed out on typewriters and sent out to journalists and editors through the mail. Nowadays we have online databases of contacts that span from Belgium to Bangalore, from Cairo to Cincinatti. We can conduct real-time online conferences with clients and get our releases out to highly targeted lists of journalists and editors globally at the click of a button. We have 24 hour access to the world’s news and we have social media to engage instantly with those interested in what we have to say…..
And yet…. it’s still about the human. Successful PR in 2014 for me is still about understanding your client, understanding their goals, understanding what they stand to gain from PR activity. It’s about seeing things from the journalists point of view, about understanding why they might want to feature your client, read your pitch, speak to you on the phone – and perhaps why they also don’t want to do any of those things sometimes. And to really achieve this level of understanding, we have to understand human nature. Communication is key – people like and are drawn to effective communicators, people appreciate it when you try to see things from their perspective, and they will naturally want to work with those that demonstrate this willingness. And I’m using the word ‘people’ because it’s not exclusive to any one industry, it’s not about journalists, and it’s not about clients – it’s just human nature. If you don’t really try to engage with your clients on a human level, if you don’t look at a journalist’s job from their point of view – then you’re never going to do as good a job as you could. Equally, if you don’t really understand your client’s goals, the big picture, and talk to them about how PR can fit in to that picture, then you are doomed to fail. If you do communicate effectively and you do make a genuine effort to understand people’s motivations, then this job becomes a whole lot easier – and a whole lot more fulfilling. Effective communicators understand human nature. They understand that everyone just wants to feel as though they are understood and that the people they work with are all striving towards the same goal. As a PR professional, if you demonstrate this same desire to your clients, to journalists and editors from the start, you are laying the foundation for long-lasting relationships – and in today’s crowded and competitive PR market, these relationships are priceless. One way to achieve these kinds of relationships is in going back to basics. 70 years ago the telephone and the working lunch were perhaps the two most powerful tools the PR operator had in his arsenal – and I still believe that to be the case. We all spend too much time sending emails to say in text something that would take half as much time to say over the phone. But the main reason we should all be using the phone more is because people feel closer and more in touch – and more loyal - to those with whom they speak or meet in person – it is human nature! 70 years ago, Harold Burson would have spent 80% of his day on the phone or ‘pressing the flesh’ – he didn’t have email, he didn’t have twitter and he couldn’t access a thousand journalists from across the globe at the touch of a button. But if he were still operating in the very same way today – I’d be willing to bet he’d still be at the forefront of the PR industry. 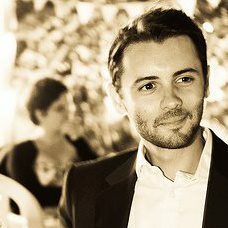 Ian Hawkings is a Senior Account Manager at BlueSky Education PR – specialising in international PR and communications consultancy for business schools and the higher education sector.